All of us bump into interesting people who have interesting stories to tell. The difference for reporters is that we get to tell those stories to others or we get to sit in a studio and record the stories. R. D. “Bob” Christoferson is one of those people. We ran into Bob last month at a Jefferson City Concert Association performance by the Glenn Miller Orchestra, directed by Larry O’Brien (who is retiring in a few months after 25 years leading an orchestra whose music remains immensely popular more than 65 years after Miller’s death). Bob Christoferson played trumpet for Glenn Miller. There aren’t many people left who played for Miller. Only Trigger Alpert and Paul Tanner are known survivors of the civilian band. Bob is one of the few survivors of the wartime band and orchestra. 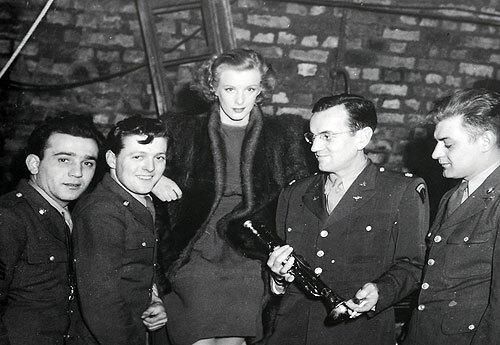 And Bob’s story is an often-untold part of the Glenn Miller history. You can hear our interview with him below. Bob was part of the “B-Band.” In the interview we’re posting today, he explains what the B-Band was. Miller was born in Clarinda Iowa—where an annual Glenn Miller festival is held every June. He spent his formative years in Colorado. But he learned to play the trombone in Missouri. Miller had begun to think by mid-1942 that he needed to join the war effort. In August, he offered to enter the Army if he could be put in charge of “a modernized Army band.” Less than a month later his offer was accepted and on October 7,he reported for duty. He hoped that members of his civilian band who wanted to stay with him also could join the Army and be in his new band. Former Miller drummer George T. Simon, who later wrote a Miller biography, recalled Miller wanted to organize “several outstanding bands” that would play “inspiring military marching music and dance-band music.” The Army Air Force wasn’t interested in that idea, though. (Bob discusses the struggle Miller had with the military over the “St. Louis Blues—March). But he was able to establish what Simon calls a “super-band” and staffed it with many of the finest big-band people from his civilian organization as well as members of other top civilian bands. You’ll hear Bob talk about the grueling schedule of the A-band, if you will. Simon says Miller created 13 programs per week for those broadcasts. In addition it performed 71 concerts throughout England. Then in October, there was more–propaganda broadcasts. Starting October 30th the band recorded half-hour programs with many songs sung in German and narration in German by Miller and his co-host, ,Ilse Weinberger. On November 25th the band started an unbelievable recording schedule. It wanted to “bank” radio shows that could be played on the BBC while the band went to Paris to perform for six weeks. In 18 days the band recorded 88 shows. 88 shows! But there was another Miller band. It started as an Army band that was put under Miller’s control. This was the B-band that Bob Christoferson was in. You’ll hear him talk about Miller’s role with it, what it did, the heavy workload it carried, and the relationship it had with Miller. 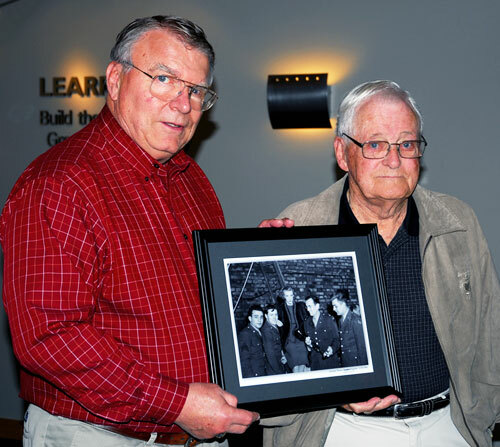 There’s even a great story about the Bob’s trumpet that Miller is holding in the photograph. Miller disappeared on a flight to Paris on December 14, 1944. Simon wrote his biography of Miller in 1974 that there had been “perverted reports” for years about Miller’s death. Bob talks about one of them that seems to have some currency during our interview. We also found an interesting website that includes a BBC interview with Miller, a propaganda broadcast with Irene Manning, the BBC announcement of his disappearance, and some conjecture about how he died. Tony Rastelli is still living and still plays saxophone, but he now does tenor sax. He resides most of the year in Stuart, Florida. It’s a real tragedy that Glenn Miller disappeared, especially at such a point in his life. I wonder what wonderful music he would have composed in the later years of his life. He was an amazing individual, and I think it’s inspiring that he chose to go into the military service.